Most scuba diving is done on compressed air. 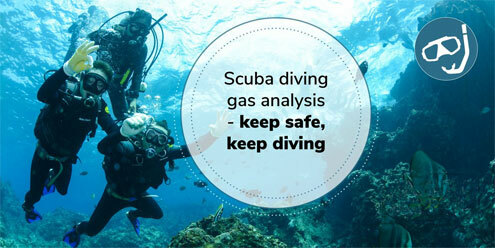 However, there are also different gas blends that can be used when scuba diving. When using these gases, the ability to analyse them is so important when planning a dive. So here we cover the gases, the analysers used, how to correctly use the analysers, plus how to care for the oxygen sensors used in the analysers. Why is it so important to analyse your breathing gas? Simply, it can kill you if it's wrong. If the oxygen content is LOWER than the diver had expected, they can end up with unexpected and unknown decompression obligations. If the oxygen content is HIGHER than expected there is the even greater risk of Oxygen Toxicity which can cause severe convulsions (not a good situation underwater). 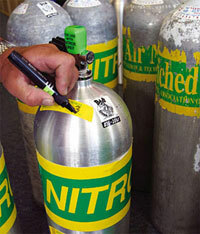 The most commonly used gas blend for sport or recreational diving is Nitrox up to 40% oxygen. Technical divers often use Nitrox gas mixes with higher level of oxygen up to 100% to accelerate decompression. More advanced technical divers use Trimix so as to be able to dive safely to depths greater than 60 metres. Nitrox, often referred to as 'enriched air nitrox' or 'EANx', is a gas mix composed of nitrogen and oxygen, and can be identified by the green and yellow markings on gas canisters. As nitrox contains more oxygen than is normally in the air of the atmosphere (20.9%), it allows divers to dive underwater for longer, without the need for decompression stops, and reduces the risk of decompression illness which is caused by an excess of nitrogen. However, there are risks with diving with nitrox, and special training is required before using it on a dive. Oxygen levels need to be monitored in order to avoid oxygen toxicity, which can have an effect on the nervous system. It is essential to analyse your nitrox gas before using it, in order to ensure the gas mix is right, and to allow you to plan the depth, time and decompression stages during your dive. RRP: $449, Our Price: $399, You Save $50 (11%). Analox offer the O2EII Pro nitrox analyser which allows divers to check the gas mix directly from the gas canister, or while the diver is connected to their regulator. Small, lightweight and rugged, the O2EII Pro can be taken anywhere. Trimix consists of oxygen, nitrogen and an inert gas, normally helium. Adding an inert gas to the mix allows divers to dive deeper than they could with nitrox (with less risk of becoming narced) and is often used in technical (tec / tech) diving. In 2001, John Bennett became the first diver to dive to 305 metres (1,000 feet) using trimix. The advantage of trimix is that it can be custom-blended to suit each dive, allowing the diver to precisely control the levels of oxygen they receive. The disadvantages of trimix is that it can be expensive (especially if you use helium as it is a very scarce gas) and custom-blending gases can be hard-work. Helium can also make divers feel colder than normal (it has a high thermal conductivity) and can cause a condition known as 'high pressure nervous syndrome' if not used correctly. RRP: $1,512, Our Price: $1,436, You Save $76 (5%). The Divesoft trimix analyser can check the levels of gas in your mix, giving you peace of mind when planning a technical dive. Lightweight, portable and comprehensive, it takes readings directly from the tank. This kit includes a professional flow limiter to ensure you obtain accurate readings. Heliox is a mixture of helium and oxygen and is normally used in saturation diving and deep diving. In saturation diving, the helium can make the divers sound very high pitched and they may need to have their speech 'de-scrambled' on the surface so that people can understand them. Argox (argon and oxygen) and hydrox (hydrogen and oxygen) can also theoretically be used, but heliox is most frequently used when diving as it is less dangerous. Heliox is even more expensive than trimix as the concentration of helium is higher. Did you know that heliox is also used in medicine? The mix of helium and oxygen reduces airflow resistance and can be used to help people with lung disease breathe easier. Do you always assume that the breathing gas in your cylinder is safe? If so, you could be making a mistake that could prove fatal. All divers should take a moment to analyse the gas in their cylinders before each and every dive. Who Bears Responsibility for Gas Analysis? You might be wondering who bears the responsibility for gas analysis. If you're not qualified to analyse your gas or don't know how, you can easily purchase the necessary tools for gas analysis and learn how to use them. If you are qualified to dive with mixed gases, you probably know how — and if you do, you should take personal responsibility for your safety by analysing your own gas. The only exception is if you dive with a team and all of you have determined how gas will be analysed prior to dives you take together. When gas analysis and confirmation is a team project rather than an individual responsibility, there is a much lower margin for error. Analysing the gas in your diving cylinders — including ones you might or might not use — is an important task that should never be omitted. To be on the safe side, you should run the process twice — once after cylinders have been filled, and again during pre-dive checks. The whole process takes just a few minutes, and once it's become habit, you won't even notice the time it takes. Analyse every cylinder that's going underwater with you, whether you think it's filled with air, oxygen, nitrox, trimix, or some other gas blend. Gas analysis isn't optional — instead, it's a necessary part of diving. Your life — and possibly the lives of those who dive with you — depends on it. We know people make mistakes, and that's why we have safety procedures in diving. These procedures help us catch the little mistakes before they create catastrophic emergencies. When diving nitrox or trimix, analyse every tank before every dive without exception. It could save your life. While the technology inside may seem complicated, modern analysers are incredibly easy to use. Most feature a simple interface, a couple of buttons, and, of course, the inlet which can pull gas from the BC or directly from the tank. Make sure to have a few batteries on-hand or charge your device ahead of time and you'll be ready to get started! Calibrate — This step is important. You should be calibrating the analyser for each use, and it generally only takes a few moments to do so. Open the valve on the tank slowly — You want a slow steady stream of gas so that you can get a consistent reading. Get your reading — Cover the open valve with the corresponding intake on the analyser and leave it on for a few seconds. You'll know you're within a few tenths of your accurate reading when the analyser begins to slow and stop changing numbers. Make sure the level is where you want it — Most recreational divers use Air, which tends to be about 21% oxygen. Sport diving Nitrox mixtures can range from 22% to 40%. Tech divers may be using 40% to 100% oxygen. Check to ensure whether your reading matches what the gas mixture is supposed to be. All Nitrox and Trimix analysers use oxyen sensor cells to measure the concentration of oxygen in the gas being analysed. Always use the correct replacement oxygen sensor for your analyser. We are aware that there are often a number of 'alternative' cells on the market, some of which are cheaper, but none are guaranteed to have been designed to mate correctly with your analyser. This means it might not fit properly, the readings you obtain may be dubious, and the cell may not last as long as a genuine cell. Most analyser manufactuers specify an expected life span for the sensors they use. It may be 4 to 5 years, or shorter, or longer. We strongly recommend that the sensors be replaced regularly based on the specified life span. Analysing oxygen requires the analyser first be calibrated and that calibration requires a 'known' gas. The gas most often used for calibration is Air, commonly described as 20.95% Oxygen. However, it's really not always 21%, in fact the Compressed Gas Association says Air can contain from 19.0% to 23.5% Oxygen and still be considered Air. Beyond the variation in actual gas composition, several other factors should be considered. Environmental factors such as barometric pressure and humidity, affected by both altitude and weather, will affect the calibration. Some inexpensive manually calibrated analysers provide compensation charts to compute the calibration target value. The most sophisticated analysers will automatically measure several environmental factors to determine the target value. Another source of variation is that all galvanic oxygen sensors are never perfectly linear across the entire range, so use a calibration gas that is reasonably similar to your target. For example, it's best to analyse 80% oxygen by calibrating with pure oxygen rather than air. Linearity is greatly affected by temperature so oxygen analysers or the sensor itself contain circuitry to compensate for temperature. However, temperature compensation is not perfect and sudden changes in temperature can result in significant variations so try to perform your calibration and analysis at stable room temperature whenever possible. Perhaps the most common source of calibration error is performing the calibration with still ambient air, then performing the actual analysis on flowing gas. If you are sampling directly from the tank and manually controlling flow with the valve, rather than using a flow limiter, the calibration is even more error prone. As a general rule we recommend first calibrating with compressed Air from a scuba tank before measuring sport Nitrox mixtures up to 40% and, whenever possible, calibrating with pure oxygen when measuring accelerated decompression Nitrox mixtures of 50% or more. Just assuming Air is always 21% for manual calibration can result in pure oxygen analysing at something like 103% which is nonsense. Given all the sources for error, our long experience is that most divers obtain a result that is slightly higher than actual because of calibration error and excessive flow. Sometimes we see a result that is lower than actual because of poor sampling technique. Given that digital depth gauges are typically only accurate within 1 to 2 metres (3 to 6 feet), and analogue depth gauges can be even less accurate, obsessing over obtaining an exact analysis of the breathing gas is unnecessary. We've even seen multiple bottom timers that varied from each other by a minute or two over the course of a single dive. The reality is that for the purposes of measuring sport Nitrox mixtures the tenths of a percent value is just noise. Many experienced sport Nitrox blenders will truncate their analysis result rather than round the tenths when labeling cylinders or programming dive computers. It's not that critical Ᾱ 30.8% and 33.3% are the same thing for the purposes of sport diving: 32% Nitrox. New analyser owners often are surprised to discover their own analysis of Nitrox fills does not match what they earlier saw or were told in the local dive shop. Variations of 1% are to be expected and are acceptable, considering the enormous number of variables involved. However, significantly more than plus or minus 1% difference from the expected result deserves further investigation. For technical diving, we don't recommend using the hand held analysers for blending applications or using their results for calculating decompression. Please use a technical grade analyzer that has built-in compensation for barometric pressure, moisture and the effect of inert gases like helium. You must also use a measured 2 lpm flow and performing frequent calibration using precisely known gas is a necessity. Because of the cumulative nature of inherent inaccuracies with instrumentation we use in diving, it's always best practice to be conservative in managing decompression and oxygen exposures. The oxygen sensors in analysers and rebreathers are complex devices, but fundamentally it's helpful to think of them as oxygen powered fuel cells. They operate on a chemical reaction that produces a weak electrical current that can be measured in order to estimate the pressure of oxygen present. Thus an oxygen sensor is an oxygen powered generator consisting of a lead anode, a gold cathode and a liquid electrolyte, typically mostly water with potassium hydroxide. A great many environmental factors affect this chemical reaction, some of the most important being pressure, temperature, humidity and of course the presence of oxygen. However, the factors that also affect the chemical reaction are those factors inherent in the manufacturing process itself such as the purity and precise amounts of the chemicals. The chemical reaction began the moment the cell was assembled, continued at a slow pace while the new cell sat in the sealed bag, and vigorously accelerates when the bag is opened and the cell is exposed to normal atmosphere. Over time, enough of the chemicals are consumed by the reaction and the oxygen sensor becomes unreliable. With the use of oxygen sensors in analysers, we are almost always analysing a known gas, i.e. we have an expectation regarding what's in the cylinder and are using the analyser to confirm it. Keep in mind, when the analysis of the contents varies from expected by more than 1% this means you do NOT know what's in the cylinder and must take appropriate action. Oh, and don't use a sensor that's been mishandled (i.e. vacuum packed, frozen, refrigerated, stored in inert gas, older than 36 months, over heated, desiccated, etc) to determine the oxygen content of an unknown gas, ever. What about using some kind of unproven life extension technique on oxygen sensors in cylinder contents analysers? (That includes 'sensor saver caps' and similar devices.) Well, recall the previous remarks about the huge number of factors that affect sensors? Some factors have nothing to do with environmental exposures, they have to do with variations in the manufacturing process. Two non-environmental factors are the purity of the lead anode and the exact composition of electrolyte; these vary significantly from batch to batch and sensor to sensor. They vary so much that the sensors have a little electronic circuit in them that the factory calibrates in each sensor to produce the final target output mv range. These factors have far more effect on the life of the sensor than any dubious benefit from after market sensor life extension techniques. Just because someone used a life extension technique on the sensor and that sensor 'lasted longer' is meaningless. There are too many factors at work to have any chance of knowing what effect, if any, the life extension technique had on the life of the sensor. To be frank, a risky practice. Heat has a major impact on the life of oxygen sensors because sensor life can be significantly shortened by excessive exposure to heat. Contents analysers should not be left out in the sun of a boat deck or in a hot car. Treat your contents analyser with respect, keep it at temperatures you are comfortable in (if you are too hot or too cold, so are the sensors). Another factor that can significantly affect sensor life is the length of time the oxygen sensor is exposed to elevated levels of oxygen. This is not usually a concern for oxygen sensors used in diving gas analysers, more for those used with rebreathers. Carbon Dioxide (CO2) will degrade oxygen sensor function as a result of formation of lead carbonate crystals on the cathode which can permanently degrade the sensor output. Vacuum pack your sensor? No. It could rupture the membrane or other seals, and might create bubbles in the electrolyte. Freeze your sensor? One manufacturer states freezing a sensor will not, 'in general', damage a sensor but this is not specifically true for diving sensors because of the hydrophobic membrane. Even that manufacturer states freezing will void the warranty, so freezing is certainly not best practice. Regardless, there is no reason to think that freezing will extend the life of the sensor. Refrigerate your sensor? Depends on the brand, but no for the Teledyne brand (10C min) and no would be best practice for all brands. Refrigeration will not significantly extend the life of sensors. Store your sensor in inert gas? Best practice would be no. Repeatedly flushing the sensor with inert gas has a risk of affecting moisture content (i.e. drying out) of sensor. Also, some concerns about 'wake-up time' after storage. Seal it in bag or with cap? Reducing oxygen exposure time might extend the life slightly. However, it probably would not make a significant difference in practice. Remember, some components are aging regardless of being deprived of oxygen, which is why even new, unopened sensors have a shelf life. 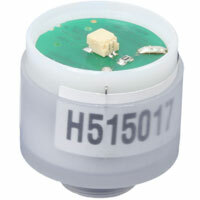 So what is the shelf life of a new, unopened sensor? The manufacturers specify the shelf life for most types of sensors at 12 or 24 months from date of manufacture, and that's reasonable for sensors intended for use in analysers. We do NOT recommend that you keep a 'backup' sensor. If you feel you must keep a spare sensor for immediate availability, such as during dive travel, then it should be discarded no later than 18 months after date of manufacture, regardless of whether it was used or not. One final thought, extending the life of an oxygen analyser sensor is a 'risk vs. reward' decision. Typical life of an analyser sensor is somewhere between 24 and 48 months. If you assume the after market processes adds one year to the life, you've saved a only a few dollars and incurred an unknown but significant risk. Nitrox cylindersClearly label anything that isn't air. If the MOD is less than the maximum possible depth of the dive (think deco cylinders), make sure the MOD stands out where not only you can see it, so can your buddies. Make it obvious to everyone if you are using the wrong cylinder at the wrong depth. For our full range of analysers, please see Helium and Nitrox Analysers.